Danciero is the undisputable champion stallion from the licensing in Westphalia 2018. Significant and beautifully shaped is how he catches the attention of the spectators. All three natural gaits accomplish the optimum, which have been performed with a strong back: walk with a lot of ground coverage, trot with maximum freedom in the shoulder and dynamic impulsion and the canter always uphill. The sire, Dancier, was the champion stallion of the Hanoverian licensing in Verden 2004. In 2005, he was winner of his performance test in Adelheidsdorf, in 2006, Hanoverian vice-riding horse champion and bronze medal winner of the four-year-old stallions at the Bundeschampionship in Warendorf. Later on he was successful up to S-level and was also successful in his breeding. He has more than 30 licensed sons, which include various price peaks. His offspring are also successful in Grand Prix and are in great demand as rideable and friendly auction horses. The still young dam, Floris was awarded the title Hannoveraner premium mare, which today equals the state premium award. 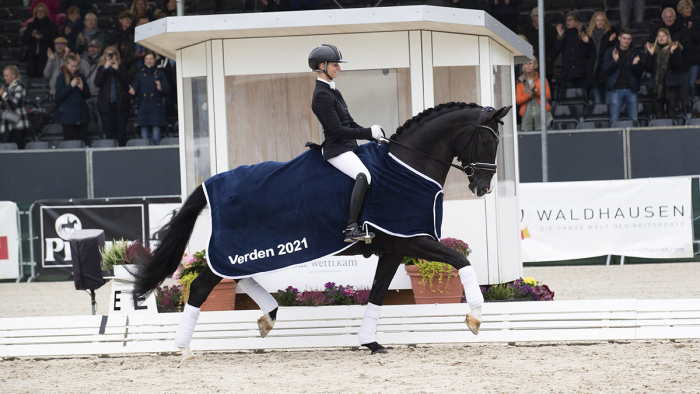 Her sire, Floriscount, was VTV dressage stallion of the year in Oldenburg, a successful participant in the Nürnberger Burgpokal and has been consistently successful at the Grand Prix level. He is considered to be one of the safest dressage sires in dressage horse breeding, whereby high basic gait quality, outstanding rideability and good size are some of the key criteria. In third generation you find Rascalino, who has been successful in dressage classes at S-level. Danciero is licensed in DWB, OLD, HANN, WESTPH, Süddt. Verbände, Mecklenburg, Rheinland. Danciero is stationed at Helgstrand Dressage.